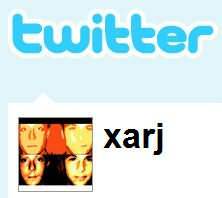 May 11th, 2008I Finally Started using Twitter! I Finally Started using Twitter! When ever a new Internet service comes out I usually quickly create a user account and spend 10 minutes just hovering over the site checking out its features and the objective of the site. Very rarely will I actually continue using the new Internet service. I signed up on Twitter a few months back and had a real hard time understanding why people were using this service! What’s the point of creating a micro blog to update your followers in less than 140 characters on whatever is going on in your mind? So I had one update and did not use it until a couple months later (yesterday). The main reasons why I gave Twiter a second chance was because of the incredible amount of users and it’s ever growing popularity. A lame and useless service would never get so much attention! 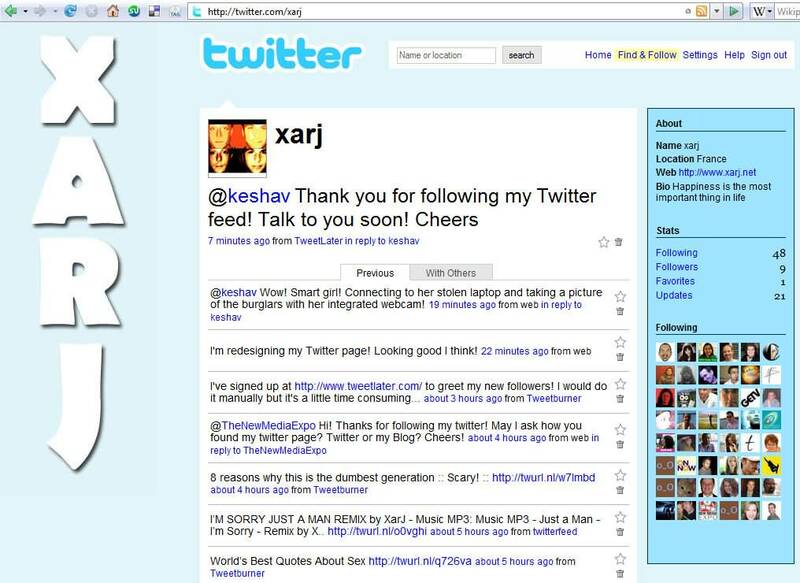 More and more serious bloggers are using Twetter and add their latest Twits on their homepage. To use @reply simply start writing your twitter message with @username (insert the username of the person you would like to send a message to) and your message should appear on this person’s page. All those “from whatever” at the end of the tweter messages simply means the message was sent using one of the numerous external Twitter services websites out there. I’ll list a few below. People use tinyurl.com or twurl.nl urls because you are limited to 140 characters and regular webpage addresses are way too long to insert in full. So these new tools simply give you alternate urls which are between 22 (twurl) and 25 (tinyurl) characters. I recommend using twurl.nl because it offers statistics about the click count and more. Twhirl –> Desktop client for Windows and Mac OS. This is like Messenger to chat with the world! It is the ultimate way to keep in touch with Twitter. Beware, Highly addictive! Those are all the extra services and plugins I currently use for Twitter but there are tons more! Check Here. One negative thing I have to say about Twitter is on the content of certain messages left by users. They post ridiculously useless messages like “I going to bed now”, “Be right back, I gotta take a crap”, “Going to meet my girlfriend later…” etc… Some people might care about reading that information but I do not and find it kind of ridiculous! It feels like people are typing anything just to increase their number of updates! If I ever post such messages, it will be rare and will be meaningful and significant to me. I’d like to hear your Twitter stories! Let me know what you think of Twitter, why you use it and your experience with this new service.